Putnam County Playhouse: WE SEE THE LIGHT!!! "Hendricks Power is committed to helping our communities thrive in all areas and this project aligned well with our efforts from a lighting, energy efficiency and safety perspective," said Dana Cochran, Director of Corporate Marketing. 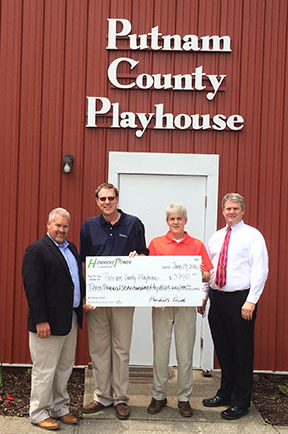 "We are glad to provide these funds and help attain the matching grant from CoBank so that the Putnam County Playhouse can continue to provide high quality productions for its community." "Our old lighting system was used when we obtained it over 15 years ago," stated Michael McClaine, Playhouse Board President. "Needless to say, this grant came just in time to avoid major disruptions in performances and insures technical lighting reliability going forward for many years." Board member Drew Brattain added, "The support we received from Hendricks Power and CoBank is greatly appreciated and demonstrates their willingness to give back to communities they serve." The Putnam County Community Foundation helped facilitate this grant by bringing the need to Hendricks Power. Hendricks Power Cooperative provides electricity and energy services to over 30,000 residential, commercial and industrial customers in west central Indiana. Formed in 1936, the cooperative is owned and controlled by members they serve. For more information regarding Hendricks Power Cooperative and other related service, please visit www.hendrickspower.com. About Putnam County Playhouse Inc.
Putnam County Playhouse (PCPH) is an all-volunteer, community theatre located in Greencastle, Indiana, with a mission to provide live theatre experience for the community and surrounding counties. PCPH is presenting its 55th season in 2016. Pictured (left to right): Greg Ternet, Hendricks Power CEO; Michael McClaine, Putnam County Playhouse Board President; Drew Brattain, Putnam County Playhouse Board Member; and Dean Gambill, Putnam County Community Foundation.